We are proud to offer a range of specialist facilities. Many of the spaces also come with specialist technical services if you need that extra level of support. You can also use our many of our facilities for events and filming. Get in touch with us to discuss your specific needs. Our green energy facility boasts a variety of functional renewable energy systems complete with monitoring. Equipped with smoke chambers, benches and microscope. 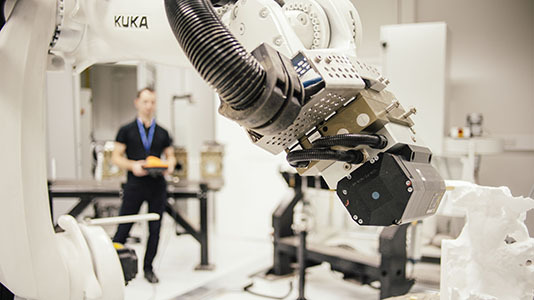 This digital manufacturing robotics lab is designed for high quality research and developing commercial applications for architecture. Read more about DARLab. Our outstanding theatre space is equipped with fully programmable sound and mixing capability. pastry brake - a specialist device with contra-rotating rollers that works pastry and reduces its thickness. confectionary making, finishing techniques and gateaux making.